With the agility of a 125 and enough muscle to take the fight to the 250 cc 4-strokes, this bike punches well above its weight. Its snarling engine sets benchmarks in terms of power and torque, rocketing its state-of-the-art chassis miles ahead of the competition. The top step of the podium does have the unmistakable scent of 2-stroke premix exhaust. 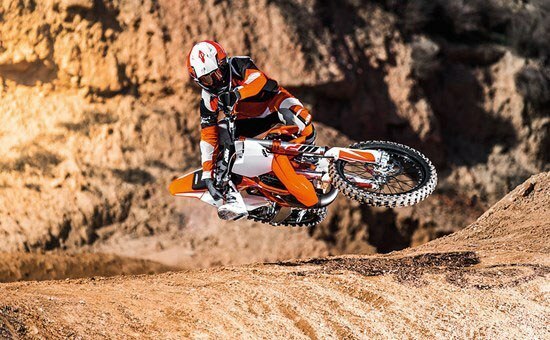 FEATHERWEIGHT: The main target for the KTM engineers when developing the SX models was a massive weight reduction compared to the previous generation. 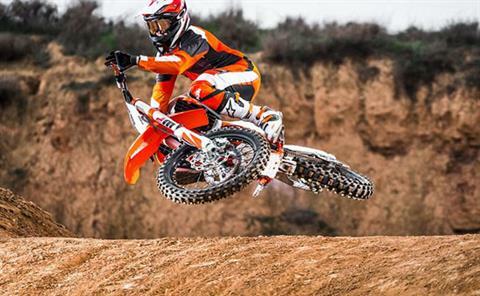 The result - the current SX models are the slimmest, lightest bikes on the track. SHOCK ABSORBER: The WP shock absorber has been developed with the entire frame and swingarm architecture in mind, including the linkage and the WP AER 48 front fork. It features machined and black anodized components and is a valuable, high-end product compared to roughcast reservoirs. A new, confidence inspiring setting with improved damping characteristics perfectly matches the front-end setup and its striking WP color scheme lets everyone know you have excellent taste in suspension. FORK: The lightweight WP AER 48 front fork, a 48 mm USD air-sprung fork developed by WP in close collaboration with KTM, is a split fork with separate functions for each leg. That means damping functions are on the right side, whereas the air spring is in the left. This left leg features a 2-chamber system with a capsuled air cartridge to prevent loss of air pressure. Should the outer seal start to leak, the internal cartridge pressure will keep the bike in position. The air spring is easy to adjust to any rider weight via a single air valve. No special tools are required; the fork air pump is supplied with the bike. The right fork leg integrates a damping cartridge that tailors to all your damping needs. It can be adjusted to the track conditions and the rider’s preferences with a twist of a dial (compression from the top, rebound from the bottom, 30 clicks each). Right off the dealer floor, this fork (with reworked damping characteristics) is more comfortable and more sensitive than ever. BRAKES: You can’t brake any harder, better, faster or stronger. These high-tech Brembo babies are combined with lightweight wave discs made by Galfer. For 2017, the rear brake features a 10 mm longer brake pedal and you get new, less aggressive brake pads all round. 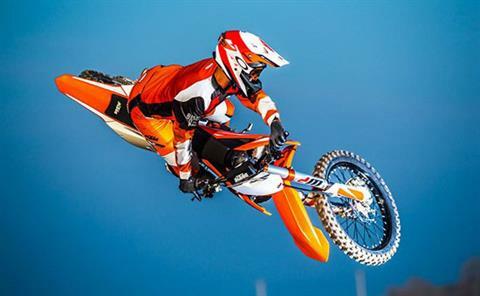 ENGINE: The engine of the KTM 150 SX was developed with the latest know-how and state-of-the-art technology. That’s the only way to craft class-leading power all across the rev range. 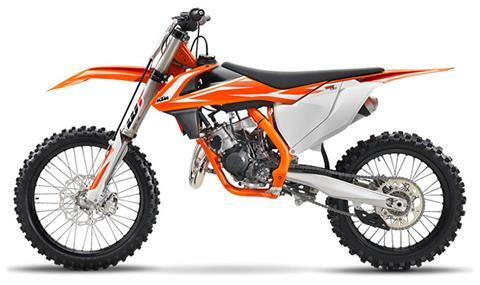 This is the lightest and most compact 150 cc motocrosser you’ll find. So prepare for surprisingly fast lap times and baffling rideability. 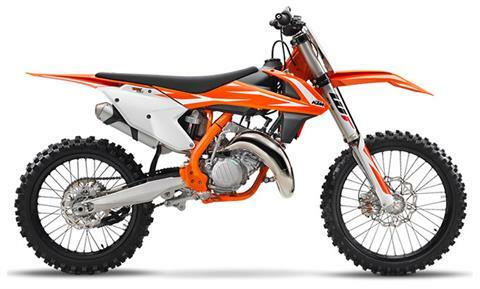 As this motorcycle shares many of its key components with the class-leading KTM 125 SX, the cylinder, head and piston unit can now also be fitted on a 125 cc engine base converting it to a KTM 150 SX without replacing the crankshaft. Buy one, get one free. Nearly. CYLINDER: This compact cylinder with a 58 mm bore features a cutting-edge power valve unit with a sophisticated mechanism for the lateral support exhaust ports. 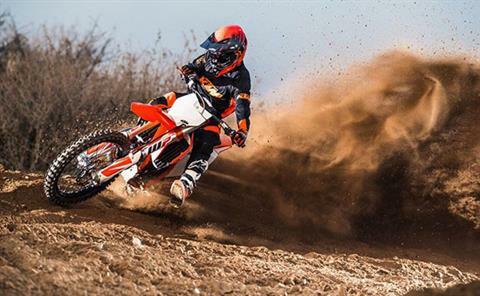 Matched to a twin-component cylinder head, it is KTM’s secret to all-round grunt. The layout of the water jackets in the cylinder and head guarantees efficient heat dissipation when the going gets tough. CRANKSHAFT: This reliable piece of engineering has been skillfully balanced to guarantee minimal vibrations. 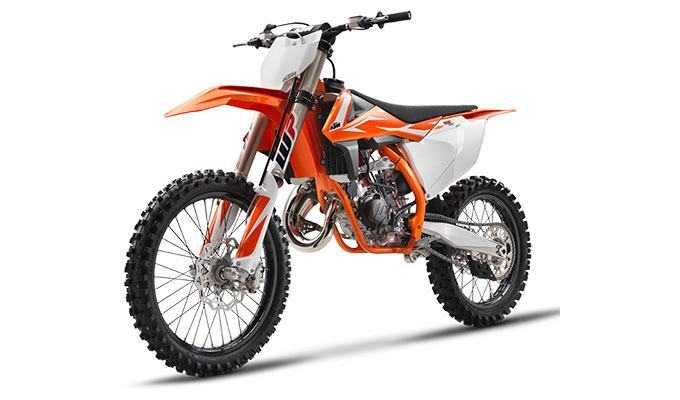 In its latest form, it allows a decrease of the displacement to 125 cc just by replacing cylinder, piston and head. There’s no longer the need to change the crankshaft if you want to change displacement. Two-in-one in no time. 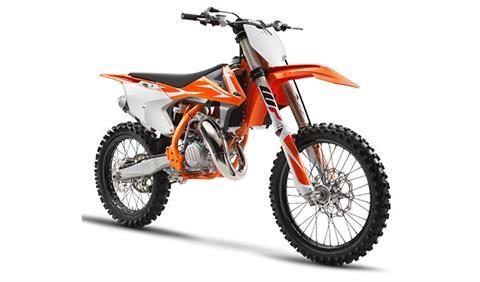 TRANSMISSION: A robust 6-speed transmission was designed specifically for the small 2-stroke engine, its gear ratios are perfectly in sync with the 150’s power band. The latest production technologies allow for compact dimensions and minimal weight. An advanced ´No Dirt´ gear lever design prevents mud from clogging the folding tip for reliable shifts even in the worst conditions. CARBURETOR: The KTM 150 SX is fitted with a MIKUNI TMX carburetor. This 38 mm flat slide carb lives to provide smooth and controllable power all the way up to the rev limitation. With a new intake manifold the carburetor is turned 7° in order to reduce the overflow of fuel. And it’s less sensitive to different altitudes and temperatures, so you can pin it wherever, whenever. GRAPHICS: New graphics convey the READY TO RACE character of the 2018 SX model line. Front - 80 / 100-21 in. Front - WP-USD, AER 48, Ø 48 mm; Travel - 12.2 in.